I have such trouble with this Zoya polish's name. I continue to call it Belle even though it's named Kerry. This polish should be called Belle, dangit! You will see why in just a second! 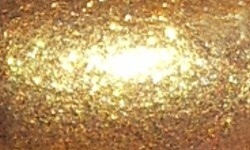 Kerry is a yellow gold foil metallic. Color: This should be called Belle, right? This is exactly the color Belle's dress in Beauty and the Beast. That's all I can think about when I see this color. Yellow golds are slippery slope for me against my skin tone, but I like this one. The finish on this is beautiful. I've never seen a finish quite like this on a gold before. Formula: This had an excellent formula. I used 3 coats above and this applied easily. Overall: Belle Kerry is a stunning and unique polish. I love this beautiful yellow gold and the amazing foil finish. I miss foil polishes! I think this is definite must have if you're a nail polish fan. It's definitely one of those one of kind polishes!